Update, Jan. 9: We have updated these statistics to the most recent numbers available as of Jan. 9, 2019. There were 12 million immigrants living in the country illegally as of January 2015, according to the most recent estimate from the Department of Homeland Security. The estimates from two independent groups are similar: The Pew Research Center estimates the number at 10.7 million in 2016, and the Center for Migration Studies says there were 10.8 million people in 2016 living in the U.S. illegally. That would be about 3.3 percent to 3.7 percent of the total U.S. population in 2016 or 2015. All three groups use Census Bureau data on the foreign-born or noncitizens and adjust to subtract the legal immigrant population. 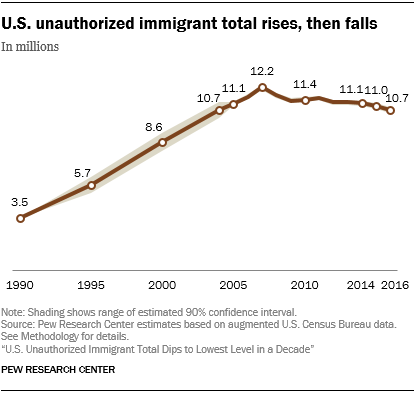 DHS estimated that the growth of the illegal immigrant population had slowed considerably, saying the population increased by 470,000 per year from 2000 to 2007, but only by 70,000 per year from 2010 to 2015. CMS found a decline in the undocumented population, and specifically those from Mexico, of about 1 million since 2010. And the Pew Research Center found a peak of 12.2 million in the population in 2007, and a decline since. All three groups find Mexicans make up the majority of the undocumented population — 55 percent in 2015, according to DHS — but the number and share of Mexicans among this population has been declining in recent years. Those living in the country illegally also have increasingly been here for 10 years or more. 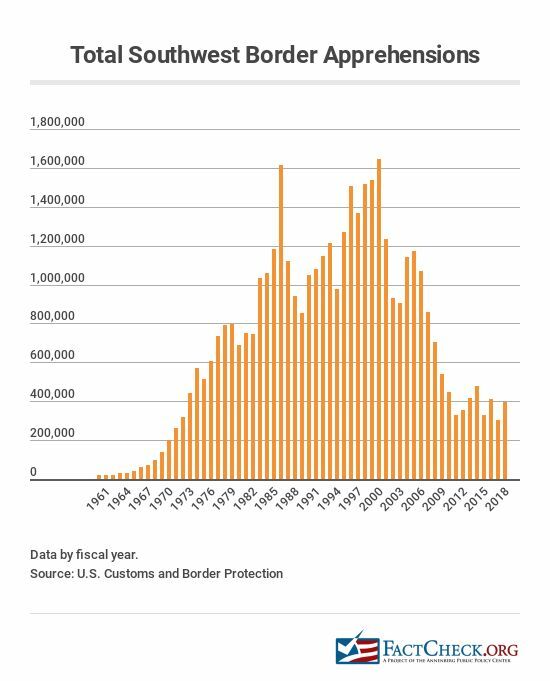 DHS says nearly 80 percent in 2015 have lived in the U.S. for more than a decade, and only 6 percent came to the country over the previous five years. That’s a 76 percent decline in the number of apprehensions between the peak in 2000 and 2018. Why can’t our immigration authorities deport the hordes of illegal felons in our cities?